Left Kaapmuiden to guard the line between there and Hector Sprui. Stationed in M Blockhouse with Pvte Wilson, Pvte Prince & 3 natives about 30 miles from Kaapmuiden. Thursday August 28th 02----Arrived at Southampton. There are other pages with information such as the men of the guards, Morse code, Kafir to English translations, Equipment at M Blockhouse, poems etc. Medal. Territorial Force Efficiency Medal. Medal. George VI medal for faithful service in the Special Constabulary. I do hope this has been of interest to some and I haven't wasted my time. 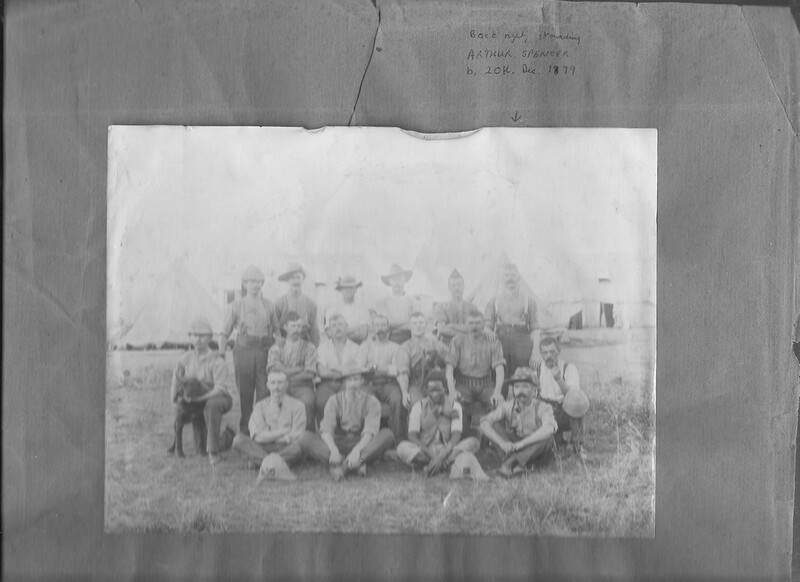 In a later post I will put a couple of photographs from the Boer War and maybe one or two from the 1st W..W.
Thank you for sharing your family records with us. Often a family's interest in their ancestors comes only after memories have faded and papers have been lost. You have done your descendants and other people a great service by adding your records to this forum. The Lincolns aboard the Tintagel Castle prior to sailing. 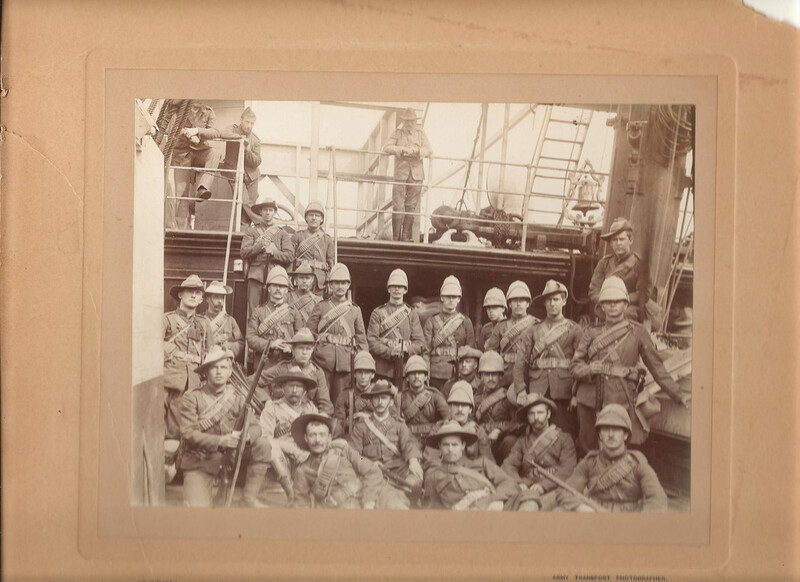 Arthur Spencer is second from the right on the bottom row. In South Africa. Unknown location. Arthur Spencer is far right on the back row. Can anyone provide more information for these two photos? A bit more information about A G Spencer. 1st Volunteer Brigade Lincoln Regiment. WW1: No. 202499 Sgt. A Spencer Regiment no. 2382. 5th Battalion Lincolnshire Regiment. Admited to 1st General Hospital Etrelat 15/10/15 - gas poisoning. Discharged as no.6241 from 4thReserve Battalion Lincoln regt. 31/07/17 but released to Ruston Proctor for munitions work 30/12/1916. Rifle instructor at Saltfleetby. No details. Early 1960s, School crossing patrol (Lollypop man) Lincoln. From left to right. 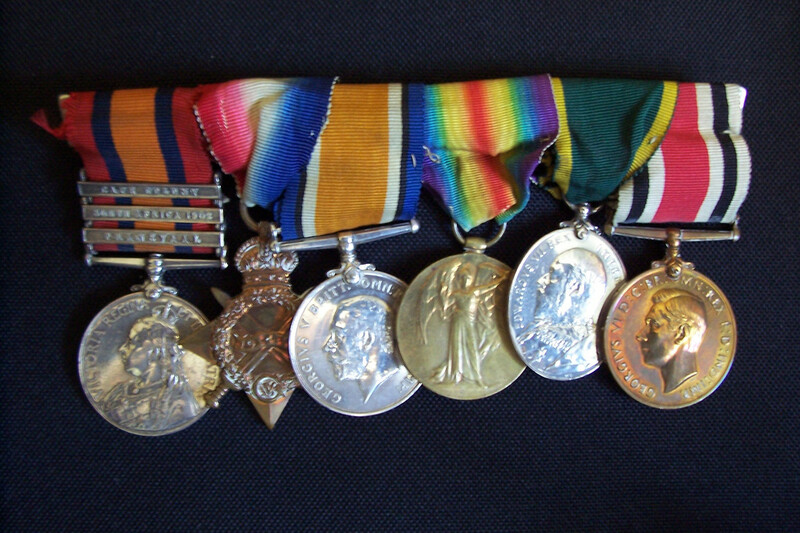 Queens SA medal with SA1902, Cape Colony and Transvaal clasps./ Mons star/ British War Medal/ Victory Medal/ Territorial Force Efficiency Medal/ George 5 medal for faithful service in the special Constabulary. Hope it is OK to stray outside of the Boer War on this Forum but it is the history of one of the soldiers from that war. Unless there are any objections I would like to post some images from WW1 to add to this story of my Great Grandfather. Certificate of service for Arthur Spencer covering the Anglo Boer War.